The sky may be the limit, but a possible scandal can certainly weigh you down a bit — just ask Diane Kruger and Norman Reedus. On Thursday, the two stars looked beyond awkward while promoting their (relatively) new movie Sky at a screening at the Metrograph in New York City. Kruger and Reedus posed side by side with forced borderline smiles on their faces. (OK, so they weren’t really smiling at all.) He kept his hands firmly tucked into his pockets, while Kruger had her arms stiffly at her side. Instead of looking thrilled to celebrate their new film, they looked uncomfortable at best — and almost angry at worst. Perhaps their stiff body language had something to do with the fact that in December a story broke claiming that the 39-year-old actress, who has been with boyfriend Joshua Jackson for nearly a decade, was spotted in a full-on lip-lock with Reedus at a dive bar in NYC’s East Village in the wee hours of the morning. According to the sources, the co-stars arrived at the 12th Street Alehouse around 1:30 a.m. and tucked themselves away at a table in the back of the establishment. In fact, the source even went so far as to claim that Kruger straddled Reedus at one point, which would be a pretty bold move for anyone, let alone two famous actors. Within hours of the story posting, a rep for The Walking Dead thesp and a source close to Kruger both denied the make-out ever occurred. Additionally, their camps argued that Sky’s director, Fabienne Berthaud, joined them at the bar, so it was three of them — not a date. It’s also interesting to note that Jackson had a role in the movie as well (but he wasn’t with them at the alehouse … not that that means anything). In any case, it seems like the story may have spooked — or irritated — the co-stars enough to make them determined to stay at arm’s length of each other. This was in marked contrast to the way they’d behaved during a similar event during the Toronto Film Festival in September 2015. 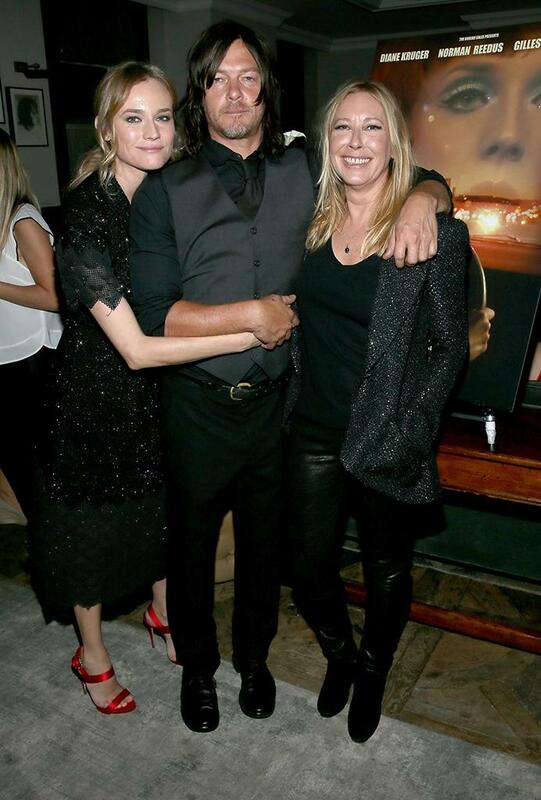 At the Soho House screening of Sky, Reedus and Kruger looked quite comfortable with each other as he draped his arm around her shoulder and they sidled up close for photos. In fact, in one snap, Reedus even took Kruger’s hand in his (not necessarily in a romantic way, but still) as they posed alongside Berthaud. Kruger and Reedus seemed relaxed and happy and totally at ease—pretty much the opposite of the way they looked last night. We may never know if there’s any truth to the romance rumors that popped up for a hot second a few months ago, but one thing for sure: They are determined not to let anyone misinterpret their relationship now — assuming they still like each other, that is.